"Our first product is an American Pale Ale, hand-crafted in the venerable tradition of English ales. It is distinguished by the use of American ingredients including Cascade and Nugget hops, and American two-row barley. 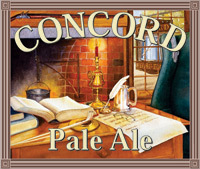 Packaged in six packs and kegs, Concord Pale Ale is available in fine restaurants and package stores in Middlesex County and beyond. Golden in color, Concord Pale Ale offers the palate a malty character and a crisp hop finish, with the citrus-floral bouquet of Cascade hops. This pale ale pours a light amber color with a fizzy, white head. Clear body with little carbonation. Aroma is of moderate hops with flower and perfume notes. Initial flavor is sweet with a light bitter finish. Dry and oily on the mouth.